A month after the zombies, witches and other ghouls pack it up for Halloween Haunt, California’s Great America will welcome Santa Claus and his cavalry. In February, Great America announced it will introduce WinterFest for the 2016 season, which will run Nov. 25 through Dec. 30. 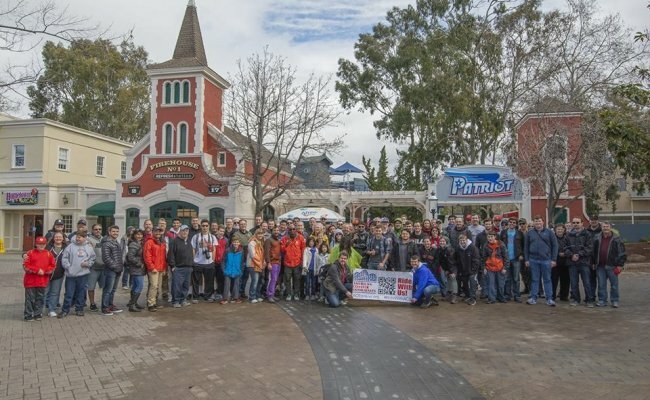 Great America invited us to a behind-the-scenes tour of the park on Feb. 21 before it opened for the 2016 season on March 25, its 40th year. The tour was led by Great America’s Clayton Lawrence and Roger Ross, who not only revealed details of WinterFest, but showed off the construction of the park’s new-for-2016 “Mass Effect: New Earth 4D Holographic Journey” attraction, answering the many questions posed to them during a walk-through of the park. “We’re going from scary to merry in three weeks,” Lawrence said, noting the end of Halloween Haunt’s season on Oct. 30. Lawrence said the park will be decorated with hundreds of lights, as well as a 68-foot-tall Christmas tree near the park’s entrance, just barely shorter than Great America’s Carousel Columbia, itself the tallest carousel in the world. Great America’s iconic entry fountains in front of Carousel Columbia will be transformed into an ice skating rink. Guests will also be able to pet reindeer and visit Santa’s workshop, in addition to live shows. Lawrence said the park has purchased a trolley, which will roam the park with live performers, harkening back to the early days of the park. About half of the park will be open during WinterFest, with guests cutting through the access road by Vortex (which is being dubbed “Candy Cane Lane”), to make their way to Planet Snoopy, which will feature Charlie Brown’s Christmas tree lot. But don’t fret, roller coaster fans: Gold Striker and Flight Deck will be open during WinterFest. Cedar Fair chose Great America to pilot WinterFest, Lawrence said, with the goal of rolling it out to other parks in the chain. But WinterFest is not the only major addition to Great America for 2016. The park’s ‘90s-era Action Theater has been completely gutted to make way for the new Mass Effect 4D attraction. Partnering with gaming giant Electronic Arts, riders will climb aboard motion-based seating while wearing 3D glasses as they travel through space to save the day. The experience will be curated by a live performer, who will be interacting with the visuals as they pop out on the larger-than-life screen. The actor will be performing the role of Conrad Verner, who Mass Effect fans will recognize as the comic relief character of the series. The seats, manufactured by MediaMation, are also capable of air blasts, scent, water blasts and more. And it’s not just a movie trailer with moving seats, Ross assured. The video has been created exclusively for Great America, featuring references to the park throughout. Fresh off the park’s 40th season in 2015, Ross said the park is undergoing the most construction and investment it has seen in the past 10 years. “It’s a pretty exciting time to be around here,” he said. With an influx in investment from Cedar Fair, Great America fans should have a lot to look forward to in the future. “Mass Effect and WinterFest are the first of many exciting additions planned for Great America in the coming years,” Great America’s Vice President and General Manager Raul Rehnborg stated in a press release. 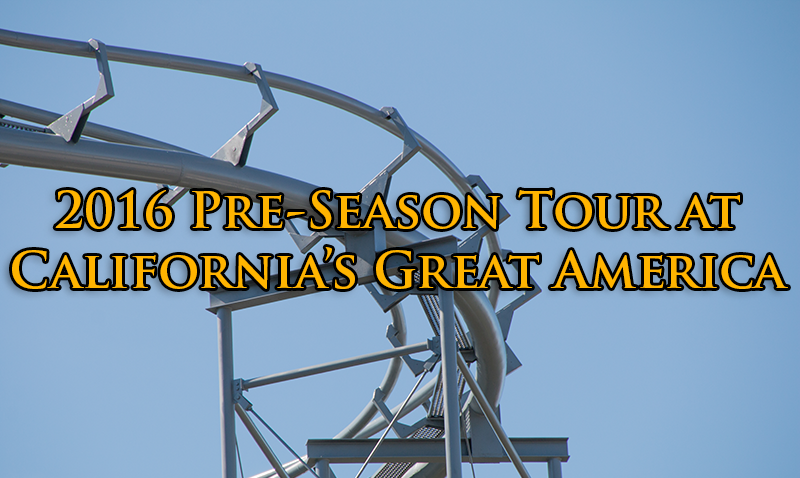 A huge special thanks to the team at California’s Great America for making our 4th annual Pre-Season Tour a great success. The park’s 40th-anniversary season opened on March 25th.